Gordian II (Latin: Marcus Antonius Gordianus Sempronianus Romanus Africanus Augustus; c. 192 – April 12, 238), was Roman Emperor for one month with his father Gordian I in 238, the Year of the Six Emperors. Seeking to overthrow the Emperor Maximinus Thrax, he died in battle outside of Carthage. Born c. 192, Gordian II was the only known son of Marcus Antonius Gordianus Sempronianus the Elder. His family were of Equestrian rank, who were modest and very wealthy. Gordian was said to be related to prominent senators. His praenomen and nomen Marcus Antonius suggest that his paternal ancestors received Roman citizenship under the Triumvir Mark Antony, or one of his daughters, during the late Roman Republic. Gordian’s cognomen ‘Gordianus’ suggests that his family origins were from Anatolia, especially Galatia and Cappadocia. According to the notoriously unreliable Historia Augusta, his mother was a Roman woman called Fabia Orestilla, born circa 165, who the Augustan History claims was a descendant of Roman Emperors Antoninus Pius and Marcus Aurelius through her father Fulvus Antoninus. Modern historians have dismissed this name and her information as false. There is some evidence to suggest that Gordian's mother may have been the granddaughter of Greek Sophist, consul and tutor Herodes Atticus. His younger sister was Antonia Gordiana, who was the mother of Emperor Gordian III. Although the memory of the Gordians would have been cherished by the Senate and thus appear sympathetic in any Senatorial documentation of the period, the only account of Gordian's early career that has survived is contained within the Historia Augusta, and it cannot be taken as an accurate or reliable description of his life story prior to his elevation to the purple in 238. According to this source, Gordian served as quaestor in Elagabalus' reign and as praetor and consul suffect with Emperor Alexander Severus. In 237, Gordian went to the Africa Proconsularis as a legatus under his father's command as a proconsular governor. Early in 235, Emperor Alexander Severus and his mother Julia Avita Mamaea were assassinated by mutinous troops at Moguntiacum in Germania Inferior. The leader of the rebellion, Maximinus Thrax, became Emperor, despite his low-born background and the disapproval of the Roman Senate. Confronted by a local elite that had just killed Maximinus's procurator, Gordian's father was forced to participate in a full-scale revolt against Maximinus in 238 and became Augustus on March 22. Due to Gordian I's advanced age, the younger Gordian was attached to the imperial throne and acclaimed Augustus too. Like his father, he too was awarded the cognomen Africanus. Father and son saw their claim to the throne ratified both by the Senate and most of the other provinces, due to Maximinus' unpopularity. Opposition would come from the neighbouring province of Numidia. Capelianus, governor of Numidia, a loyal supporter of Maximinus Thrax, and who held a grudge against Gordian, renewed his allegiance to the reigning emperor and invaded Africa province with the only legion stationing in the region, III Augusta, and other veteran units. Gordian II, at the head of a militia army of untrained soldiers, lost the Battle of Carthage and was killed. According to the Historia Augusta, his body was never recovered. Hearing the news, his father took his own life. 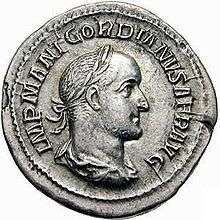 This first rebellion against Maximinus Thrax was unsuccessful but, by the end of 238, Gordian II's nephew would be recognised emperor by the whole Roman world as Gordian III . ↑ In Classical Latin, Gordian's name would be inscribed as MARCVS ANTONIVS GORDIANVS SEMPRONIANVS ROMANVS AFRICANVS AVGVSTVS. ↑ Birley, pg. 341. An inscription confirming this fact has been found at Caesarea in Palestine. Wikimedia Commons has media related to Gordianus II.